Each month we will put together a selection of five of our gourmet garlic bulbs and team them together with our 'Flavour of the Month' and 'Monthly Farm Favourite' (this can range from a delicious chutney to an everyday condiment or mayonnaise). A recipe of the month will also be included to help inspire you. Please note that this membership is available for dispatch to the UK mainland only. 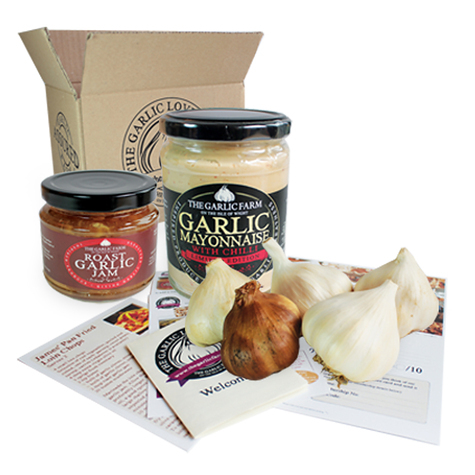 Payment cannot be taken via Paypal for this monthly Garlic Lovers' Club subscription. Please do not select the Paypal option at the checkout. TERMS & CONDITIONS: By joining The Garlic Lovers' Club, you agree to The Garlic Farm storing your payment card details which are fully encrypted and stored on the secure SagePay server. Your stored card details will be charged for the cost of each monthly subscription every calendar month for each monthly subscription. Each month your subscription will be charged during week1-2 of the month and your subscription box will be dispatched during week 2-3 of each calendar month. You have the right to cancel this subscription at any time. To cancel your membership simply call our office on 01983 865378, or email enquiries@thegarlicfarm.co.uk. I authorise for The Garlic Farm to deduct £19.95 from my account monthly.